The idea for Case.one came from my own need and experience. 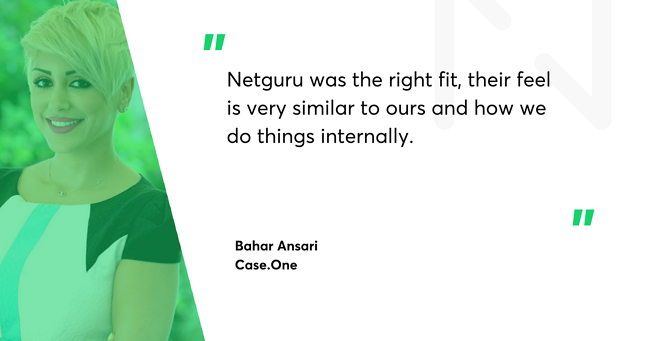 After struggling with the legal practice project management minutiae for years, Bahar gained enough experience (and frustration) to build a genuinely useful, working solution. The idea behind Case.one is to disrupt the legal market globally. The product is currently used by attorneys in France, Russia and the US. It’ll be introduced in the UK and several other countries shortly. Even if legal systems differ, the legal process is the same. The affordability of the product is a major factor, but competition is limited. According to Bahar, many law firms aren’t taking full advantage of modern technology – the market is penetrated in only about 30 percent. Attorneys need to be taught that technological solutions to their problems exist, and they need to be taught how to use them. By giving them platforms that simplify everyday work, Case.one helps attorneys get access to bigger markets and bring their overheads down. This means more business and success for attorneys. It also means alleviating the problem of inadequate access to justice. Bahar has a humanitarian background. I used to dream of working for the UN. She’s also involved in a nonprofit focusing on making justice more accessible through education and technology. Case.one’s co-founder, Alex Pelevin, is very innovative, and his motivation to disrupt is, in a sense, simpler: innovation for innovation’s sake. He agrees that the problem exists and wants to solve it, but his is more of an Elon Musk approach. Surprisingly, this difference between the co-founders brings synergy in two different approaches coming together. Their goal, after all, is the same. Case.one’s pricing model makes it an affordable solution for young attorneys, just starting out and with limited access to similar, more expensive solutions. Most of Case.one’s competitors have a user-based pricing model, which ramps up costs very quickly. Case.one chose a case-based model: the platform is free to use under 10 cases, which means that costs begin to apply only when an attorney begins to see some success. Bahar wants to expand and scale with her clients by giving them the tools that will help them succeed. Case.one is pay-as-you-go, without any contracts. According to Bahar, it’s not about the money – she is on a mission to solve a very real problem in society. This, of course, doesn’t mean she can’t experience a business success as a ‘side effect’. People choose to use the platform. We have training programs and a lot of support. We make sure clients don’t get lost. This client-centric approach might be the key to Case.one’s popularity. Case.one’s customer base is growing, both in numbers and in diversity. On the US market, they initially focused on small to mid-sized law firms. Because the product is very robust, it’s a better fit for larger firms which can really take advantage of the depth of the features (such as reports and data analytics). Those larger firms have been Case.one’s market more recently. They conducted some tests and are comfortable with approaching a larger market. Case.one’s international clients are generally large, mature organisations. The international market itself is an interesting case: it consists of many in-house legal departments and is largely ignored by Case.one’s competition. One of the biggest problems of those legal departments is that they usually lack a system that would let them manage outside counsel. Case.one can help them. Bahar’s approach is brilliant but simple: offer not only all the main features provided by her competitors, but also everything a law firm needs to progress and scale. Bahar has the advantage of her experience when choosing those features, but she and her partner haven’t forgotten the importance of feedback. Their process is to gather feedback for 30 days, develop new or improve the existing features for another 30 days, then do a new release. It takes 60 days from receiving feedback to a new release, which is a fairly short loop. If they receive the same suggestion or complaint more than two times, it goes on their list. We like taking problem requests not feature requests. We like to come up with the features that solve the problem ourselves. This doesn’t happen that often. Many problems have already been solved thanks to how customisable the system is. Bahar is a proponent of an internal approach: focus and do what you’re good at. They use this principle often to avoid reinventing the wheel. Bahar is not a technology expert, and her business partner is a UX designer. They chose Netguru because we have a similar approach and company culture. It turned out to be the right fit. Our task at Netguru is to create the designs for Case.one. Design work is often outsourced, usually to freelancers. But Bahar and her partner focused on the importance of good reputation and consistency – that’s why they opted for a software agency. You make a choice based on what you’ve seen, and you want your business understood and supported by the agency you’ve picked. The design is very important for a platform whose aim is to improve productivity. A platform like this needs to have excellent usability, which makes UX a crucial element. It also has to look fantastic and be a strong representation of the brand. This is why it was important to choose a good UX design agency. We were after a well-designed website representing a well-designed product. Clients should be impressed with what they see from their very first contact with the website. Case.one launched in the US in January this year. They’ve been in business almost 9 months and have grown very quickly. They have goals for further growth for the next 6 months, including a user count they want to reach. They want to gain access to legal departments of large companies. They are doing market research to discover new markets and find new problems to solve. In the next few months, Case.one will release 3-4 new products. They also have a number of innovative products planned for the beginning of the new year – they’ll need a user base for all of those. It looks like there’s a whole lot of work ahead of Case.one. Case.one have learned a lot, according to Bahar. I’m not a tech savvy person, so learning about technology was my biggest challenge. You just do it because it’s so interesting. She was a traditional attorney before co-founding her business. The most valuable lesson to her was finding out how many everyday tasks and problems can be solved through technology.